On June 14th of 1919 at St. John's, Newfoundland, Captain John Alcock and his navigator Lt. Arthur Brown made history as they began what would become the world's first non-stop transatlantic flight. For their troubles they were awarded £10,000 by the Daily Mail, a newspaper then-renowned for offering various prizes for notable achievements in aviation. 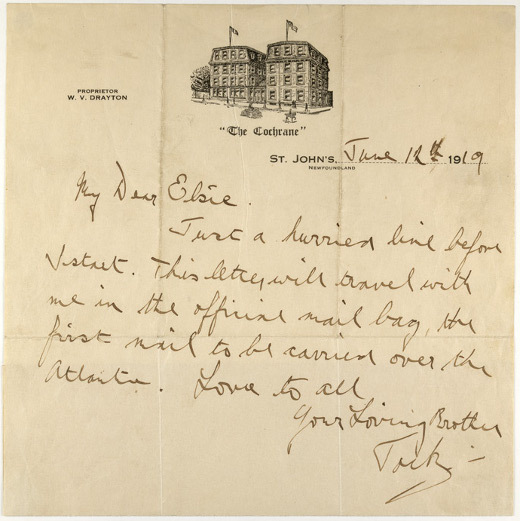 Below: a letter written by Alcock to his sister Elsie prior to the flight which, after then travelling with the two men in their Vickers Vimy bomber, soon became the world's first transatlantic airmail. Transcript follows. Image courtesy of the British Library.